We bring you the beauty of crystal chandeliers, an art born over 300 years ago in the land known today as Bohemia, Czech Republic, now a part of Europe Union. 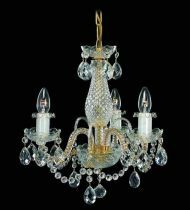 The crystal chandeliers come in many styles and different sizes. Intimate line consists of dainty or smaller chandeliers designed for smaller areas where intimacy is desired, such as small dinnig areas, sections of large living room, porches, foyers and other places where smaller sizes better represent the required mood and decor. These chandeliers have another positive property, the components in them create a more compact, luxurious appeal than their larger brothers, which reflect itself when placed above a fine, but smaller dinning table, just to use a small example. They are great favorites with those seeking exclusive quality and cozyness. The Intimate line. But in addition to coziness, we in America have been pampered to larger areas in our homes and offices than one would find in the rest of the world. 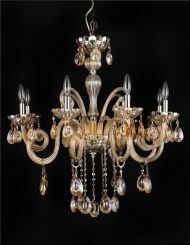 Naturally, to larger places, the need for larger chandeliers is obvious... and Tomia Crystal Chandeliers has them as well. 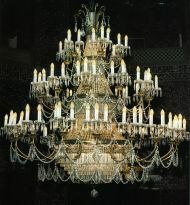 Chandeliers from 30 inches or more in either direction are already considered as large, by this standard. We have a complete line of them. Large chandeliers. But it does not end there. Tomia Crystal Chandeliers will make to order any size or style chandelier to decorate your large living room or the Grand Ballroom of luxury hotel. 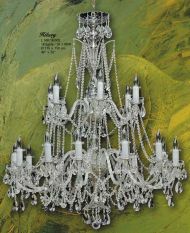 We can custom the chandelier, small or huge just for you. Classic Bohemian chandeliers, Luxury and exclusive chandeliers, Custom Estate chandeliers, Wall sconces and candlesticks, Large chandeliers and The “Intimate”.